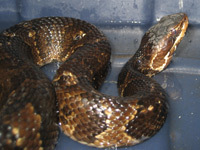 This is a heavy-bodied aquatic snake that inhabits the southern US. They are fairly common in Florida. This one was caught in Orlando. They are members of the pit viper family. Most pit vipers are rattlesnakes that live on dry land, but the Water Moccasin does not have rattles, and it lives in water and swampy areas. This snake isn't as aggressive as many of the rattlesnakes, but it'll certainly bite if you get too close and it's agitated (or if it senses your heat), and the bite is horrible. It's lethal from a larger snake, and is sure to destroy your tissue and leave you without whatever body part got bitten. Be very careful around this snake. 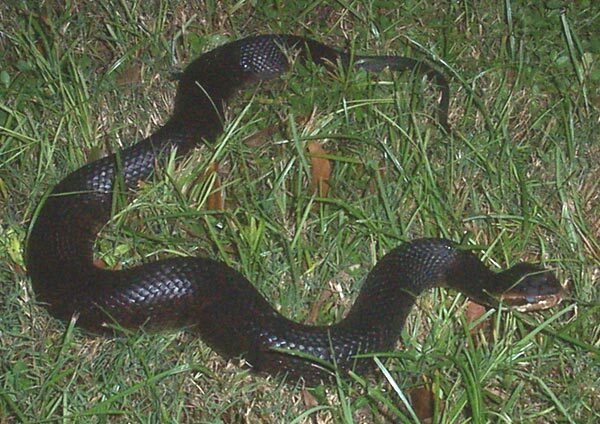 Here is a photo of a Water Moccasin. The snakes are born more brown and tan, with a pattern, and they darken as they age. The one in the above photo is a large adult, close to shedding, and it looks mostly black. Click here for a photo of a baby Cottonmouth (Water Moccasin and Cottonmouth are different names for the same snake) and you will see the different color pattern. The Water Moccasin snake characteristics - Water moccasins, or cottonmouth snakes, are found near bodies of water in the southern part of The United States. These vipers are deadly, and received their name because of the way they present themselves when threatened. The cottonmouth will hold itself erect, opening its mouth. The inner tissue is white; a sharp contrast to the dark skin of the snake. There are no clear origins for the name water moccasin, though people attribute it to Native Americans and their experiences with the semi-aquatic snake. You will rarely have nuisance concerns with water moccasins. These snakes do not see people as prey, and they will leave humans along if the snakes are not harassed. 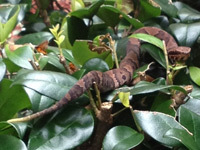 The cottonmouth feeds on the animals that live in and near the water. It is capable of attacking its prey underwater as well as along the shore. These venomous snakes are often confused with brown water snakes. The main difference is that brown water snakes swim with most of their bodies submerged. Cottonmouths are very buoyant, and their length is visible while they swim. Because of the time spent in the water, the body temperature of these snakes needs constant renewal. For this reason, when not hunting, they are often seen sunning themselves along the bank. How does a water moccasin snake hunt and kill - A water moccasin snake is referred to as a pit viper. All vipers in North America have heat-sensing pits in the space between their eyes and nostrils. These pits are able to detect the body heat of prey animals and will give the snake an exact location before a visual is acquired. Like most pit vipers, the water mocassin will strike its prey, injecting venom with the attack. It will then allow the animal to run off and die. Using its sense of smell, the snake will follow the animal�s trail so it can then begin to feed. 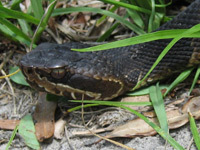 water moccasins like to eat rodents and other small mammals. They will occasionally eat insects and amphibians as well as other snakes. When a water mocasin bites a human, it rarely injects enough venom to kill. The main goal of the snake is to get away; it does not see humans as a prey animal. If the snake wanted to eat us, there would be no problem injecting enough venom to do the trick.